Civilization 3 Complete is Free on Humble Bundle for a limited time. The Steam key of the classic Sid Meier's game, which normally costs $4.99 can be yours for nought. The game is a classic 4X, for those unfamiliar with the term, it means eXplore, eXpand, eXploit and eXterminate (as in explore the map, expand your cities, exploit luxury resources, and exterminate your enemies). It is a turn based game like most 4X titles, and is considered as one of the best franchises ever made. 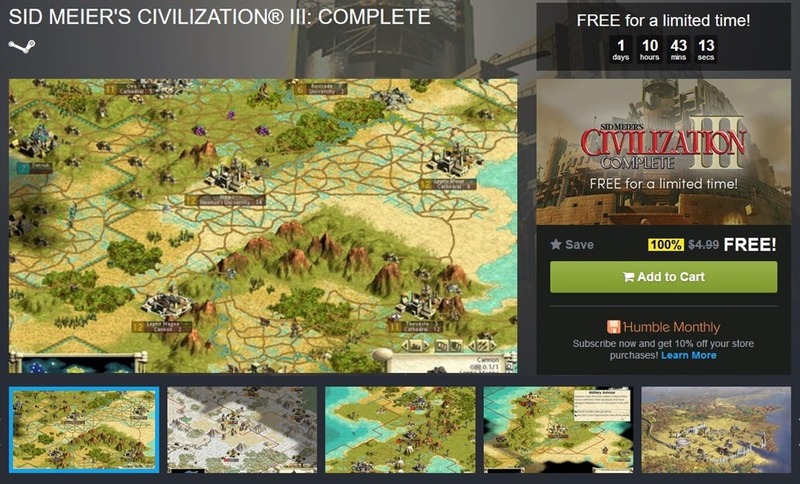 My personal favorite is Civilization V Complete, which you can currently get for just Rs. 228 from Gamersgate. Civilization 3 has its downsides though, the graphics are dated and a bit cartoon-ish. But it does give it a unique look. And for the price of zero, we can't really complain. So, go to the Humble Store, login to your account, and click on the add to cart button, and checkout for free. You will need to link your Steam account to your Humble account, to redeem the key. This giveaway is live for another 34 hours or so, but you have until 10AM Pacific on Saturday, October 21st, 2017, to get the key. Already have the game? You can still get a key for free and gift it to your friend.